Learn how to ask for feedback in your workplace with these 4 easy-to-follow steps. Increase your employee engagement and build up a continuous feedback culture! Building a “continuous feedback culture” might have greater effects than you can imagine. A research conducted by Teresa Amabile and Steven Kramer showed that a sense of progress is one of the most powerful motivators in the workplace, even more than personal or economical recognition. Progress impacts performance and usually high performers offer more positive feedback to peers. Tap My Back is an employee feedback app that helps organizations building a continuous feedback culture and improving employee engagement. As a matter of fact, high performing teams share almost six times more positive feedback than average teams! Getting useful feedback can be the fastest route to growth and improved performance. The better your team will perform, the more positive feedback it will be sharing, and the better the overall vibe and engagement within your team will be. So, why wait for the formal annual performance review? The adult brain learns best by being caught in the moment; productive feedback requires giving it frequently. Start taking control of the feedback you can give and receive. First, by learning how to ask for feedback, and therefore building that continuous feedback culture that will improve your personal and team’s performance! Concluding, stop waiting for the final annual review to receive or give feedback to your teams! Another great way to give feedback and ask for it is by having integrating it with feedforward. Start asking for feedback now – try Tap my Back for free! 1. If not given spontaneously, ask for it! Don’t be afraid to ask your team for a direct feedback on a specific topic; you will probably set the example for others as well to engage more and ask your feedback too! 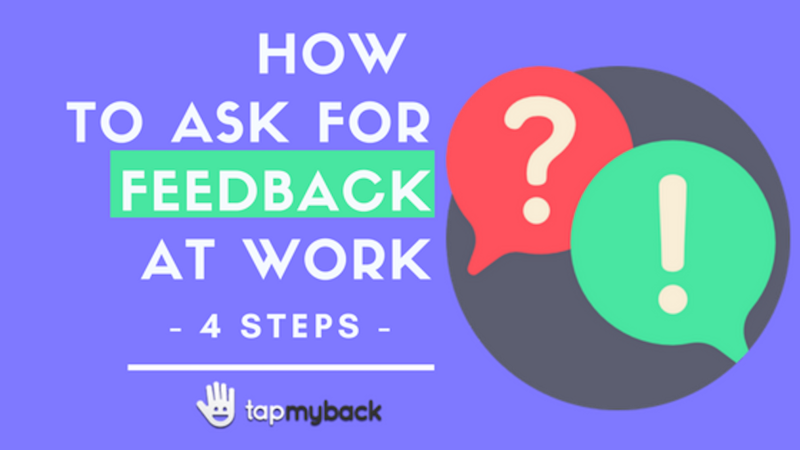 With Tap My Back you can give feedback proactively and ask for it whenever you feel it’s needed! Make sure your timing is right; asking for feedback straight away will ensure much higher response rates and result in a better engagement. If you can’t do it in person, use Tap My Back‘s Ask feature, that allows you to create different types of surveys. 3. How did I do? Could have I done anything differently? Giving feedback is often associated with the fear of being judged or judgemental. Get rid of it by showing appreciation for the feedback received and ask questions if you don’t understand something.